for a chance to film & interview Dinosaur Jr.! Ready to submit your YouTube HD video? Please make sure you've read the full terms & rules for entering this contest! Shoot an HD video (720p, 1080i/p) of yourself asking Dinosaur Jr. a question about BUG, upload it to YouTube and post a URL to your entry here to be entered in the once in a lifetime contest to film & interview Dinosaur Jr.! For our contest submission entries, if you do not have a YouTube account, click here to create one! 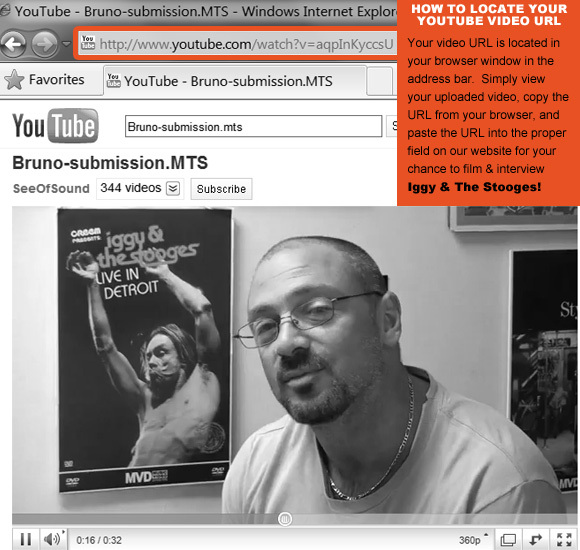 Step 1 Post your video to YouTube and locate your video URL Create your video and upload it to YouTube, then post your video's URL here. Click for example.